Are you searching for BHEL company jobs? They have recently announced huge openings for freshers and experienced candidates. Want to apply for it? Now check it below. All Interested Candidates should have complete Diploma / Graduation Degree in Industrial Safety or its equivalent qualification from a recognized Board or University. For Post Wise Qualification Go To Detailed Notification. Candidates upper age limit should between 21 to 33 Years As On 01-03-2016. For Postwise Age Details Go To Detailed Notification. Age relaxations will be applicable as per the Govt rules. Payscale : Candidates Can Get Pay Scale Rs. 49, 930/-. All Qualified Candidates Can Download application Form through official website . After Filling The application , Applicant must send hard copy of application along with relevant testimonials (Mentioned In Detailed Notification) to the Given Address on or before 1-03-2016. 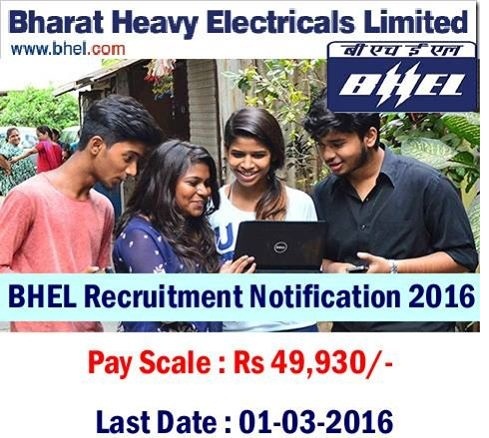 You have to open this Official Notification to get more information about BHEL (Bharat Heavy Electricals Limited)Recruitment 2016. Contenders may bookmark this page by using Control + D for getting latest info on BHEL (Bharat Heavy Electricals Limited) Recruitment 2016.